I tried so hard for it not to happen. And many years I have been successful, but I just couldn’t keep them away this time. The fleas are popping up around around house. DRATS! When you have a household furry friend there are many preventive measures you can take to keep the fleas away. Vacuuming on a daily basis to remove eggs, larvae and adults is the best method for initial control of a flea infestation. It is important to vacuum the following areas: carpets, cushioned furniture, cracks and crevices on floors, along baseboards and the basement. Steam cleaning carpets may also help as the hot steam and soap can kill fleas in all stages of the life cycle. Pay particular attention to areas where pets sleep. Wash all pet bedding and family bedding on which pets lie in hot, soapy water every two to three weeks. If an infestation is severe, discard old pet bedding and replace it with fresh, clean material. Flea combs are very effective tools in the suppression of adult fleas. They allow hair to pass through the tines but not the fleas, removing fleas as well as flea feces and dried blood. Focus combing on those parts of the pet where the most fleas congregate, usually the neck or tail area. When fleas are caught, deposit them in hot soapy water to kill them. I do a good job keeping things clean around here. And I know when spring and summertime comes around, its vital to take a bit more precaution. But the fleas are waging the war this time and I need to stop it quick. Now its time to look into topical flea treatments, specifically spot-on products (i.e., the one that generally comes in tubes or vials and is directly applied to specific areas on the pet’s body to control fleas and ticks). But what is the best way to safely keep your pets free of fleas when buying spot-on products? Surely, we all have heard complaints about topical tick and flea treatments. In fact, in 2009, the EPA logged some 600 pet deaths and about 44,000 reports of harmful reactions, including skin irritation, vomiting and seizures. So the Environmental Protection Agency (EPA) issued an advisory warning consumers who use specific types of flea and tick control products on their pets to take precautions. The advisory applied nearly 70 “spot-on” products, including Frontline and Advantage products, that contain registered-pesticides (yup, pesticides – scary stuff). The Natural Resources Defense Counil (NRDC) published a pocket guide to flea and tick treatments, which provides the group’s assessment of chemical used in pet pest control products along with safer alternatives. If you pet experiences a bad reaction from a spot-on treatment, immediately bathe the pet with mild soap, rinse with lots of water, and call the vet. Do not apply a product to kittens or puppies. We went to the pet store to pick out a spot-on treatment for our friendly feline(s). Sixty dollars for a 3 month supply?!?! Ouch. So we checked out the cheaper brands and compared. Etofenprox was not listed on NRDC’s pocket guide (discovered after I got home). However, I thought with the chemical being in the same ‘prox’ family (as the Pyriproxyfen) I went with the first choice for three reasons, it was $2 cheaper, contained the same ingredients, and I received an extra month supply. Great deal, right? NOT! After researching Etofenprox, I found out some disturbing information. Etofenprox is a Pyrethroid (aka permethrin). Permethrins should NOT be used on kittens or cats. I found this alarming shout out on various websites. So why do various companies, like Bio Spot, Zodiac, and Seargent’s use this pesticide in their flea products??? I discovered the answer (yes, this post is longer than intended but I had to share the info). I discovered a product performance evaluation review in regards to etofenprox and discovered it works just as well as the high priced Advantage for Cats containing imidacloprid) and FrontLine Top-Spot for cats (containing fipronil). BUT products containing permetherin (like etofenprox), while have a good range of safety on dogs, a few drops of concentrated permethrin could be lethal to a cat. The signs commonly seen with permethrin toxicity in cats include generalized tremors, muscle fasciculations, and seizures. Signs can develop within hours or may be delayed up to 48 hours. Companies can produce a cheaper product proved to be just as effective as the top brands despite the fact its harmful to cats (but they don’t have to tell you that). Shame on these companies developing such unsafe products! Cat Owners: stay away from products containing etofenprox! While I didn’t price out the products for dogs, if they contain etofenprox your animal is safe under directed guidelines. Research proved to a valuable lesson. And in this case, quality is much better over quantity. I am returning my Cheap-O product and coughing up the $60 for Frontline Top-Spot for Cats. Another Option: Anyone have some green friendly pet practices they use for keeping the fleas away (like using flea treats) or a eucalyptus collar? 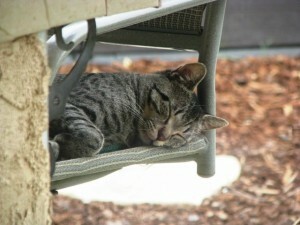 This entry was posted in Family & Relationships and tagged pets, spot-on flea & tick control on 2010-06-27 by Christine.